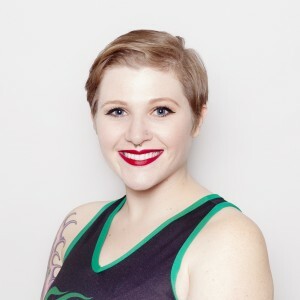 My favorite professor in college was one of the founding members of Detroit Roller Derby. She invited me to watch one of her games and it was love at first hip check! Scream-singing into karaoke microphones and telling my cats how beautiful they are. ERIN JACKSON! SHE CAN SKATE ON ANYTHING!! HAVE YOU SEEN HER?!? SHE WAS IN THE OLYMPICS! I swam for one season my senior year of high school. I won the “Most Improved” award. Not yet–I’ve only skated in two games so I haven’t established any rituals. Someday I will successfully jump the apex like the valiant jammers before me. That day is not today. Tomorrow doesn’t look good either. But someday. Derby helps me stay balanced, gives me a supportive community, and reminds me that my body can do amazing things and deserves to be taken care of. Derby also eats up every second of my free time. Derby is life.